This ornament set is an event exclusive and one of 3000. Metal. Inspired by concept artwork from Star Wars A New Hope. Futurist and artist Ralph McQuarrie created many of the conceptual designs for the first Star Wars feature film, including the initial designs of the Droid duo of C-3PO and R2-D2. 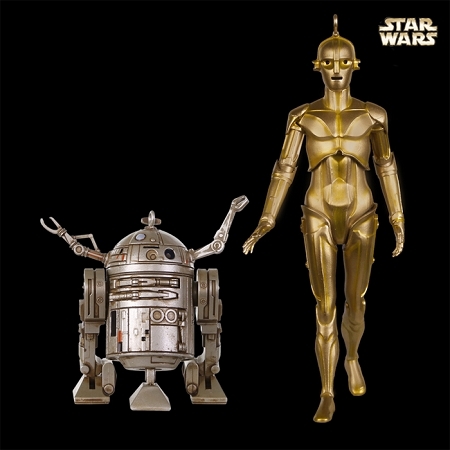 When first envisioned, the golden proto droid featured a much more humanoid face and figure, while the barrel-shaped Astro droid sported numerous appendages and vaulted rather than rolled from place to place.